Ricoh's inkjet (IJ) print heads feature a push-mode piezo actuator, which is durable and compatible with a wide range of inks. In push mode, a piezo device generates pressure fluctuations in individual ink tanks to push the inks out through nozzles. In conventional push-mode piezo devices, the supports of the individual ink tanks were weak, resulting in a mutual interference between the tanks. It was difficult to maintain the stability and accuracy of controlling ink discharges. 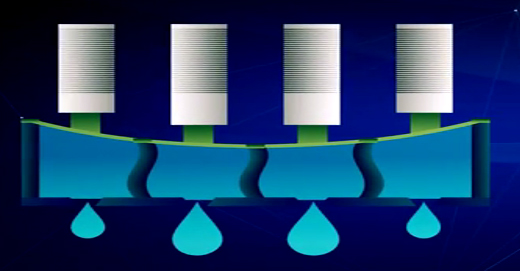 Ricoh's proprietary bi-pitch laminated piezo actuator enables stable, accurate control of ink discharges. The supports for individual ink tanks are weak with the conventional push-mode piezo device. When a piezo actuator pushes the tank, it influences and warps the adjacent tanks. Consequently, the amounts of ink discharges vary in the center and ends of the head. To solve this problem, Ricoh uses active and inactive piezo poles. An active pole, which produces pressure fluctuations in an individual tank, is supported by inactive poles at both ends. This construction prevents mutual interference between the adjacent tanks. 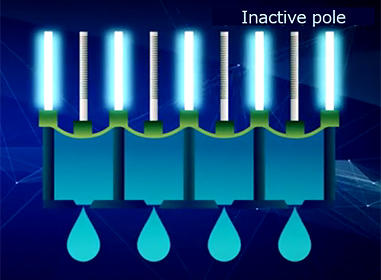 The inactive poles located between the individual tanks enable stable, accurate control of ink discharges from the tanks. Further, the active and inactive piezo poles are alternately positioned at a density double the nozzle pitch. Push-mode piezo devices are generally rigid, but Ricoh's construction is even stronger and boasts high durability. The stable, accurate control of ink discharges has enabled high-speed printing while using optimal drop sizes for different images (multi-drop technology(Japanese)). The speed and quality of printing have been greatly enhanced. This is a platform technology for Ricoh's proprietary IJ head, and is used in many Ricoh IJ products. Technology categories: Field – "Printing" | Product – "Production printer" "Industrial inkjet" "Multifunction printer/printer"